QUMRAN: Caves and Monastery of the Dead Sea Scrolls is part of the Tentative list of Palestine in order to qualify for inclusion in the World Heritage List. It seems rather strange to be reviewing a Palestinian Tentative List site when we visited it as an Israeli National Park using our Israeli 2 week “multi visit” pass! The answer lies in the fact that, whilst it may be within “Palestine” as recognized by the Oslo Accords, Qumran is still under full Israeli control. 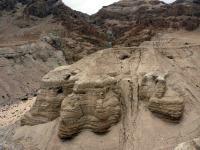 The site of course has “World-wide” fame as the location where the Dead Sea Scrolls were found. We hadn’t expected that there would be much to see but found the visit of interest in providing background into the “Essenes” – an ascetic sect from around the 2nd century BCE who wrote the scrolls. The site consists primarily of their excavated communal living quarters (Ritual baths, refectory, scriptorium etc) with distant views of caves in the hillside and in the nearby eroded Wadi (photo) – including the original “Scrolls Cave”. There is also a small museum and a dramatized audio visual presentation which portrays their life, beliefs and practices. The site gets busy with coach trips ex Jeuralem for whom it is yet another stop on their Dead Sea/Masada expeience. Without our prepaid pass we might have passed it by given its cost of 29NIS (6.1 Euro) for a pretty short visit - 45 minutes unless you go for a hike towards the hills (these were closed when we were there because of fears of flash floods). On reflection that would have been a mistake and I am glad we have a personal “vision” of this famous location.